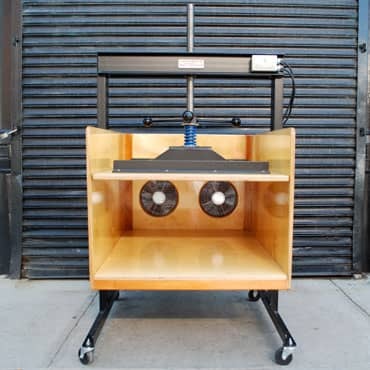 We have available a paper drying box that will accommodate paper up to 30" x 40" in size and will dry up to 75 sheets. No more blotter exchange; with this system, one loads the box with damp paper and turns on the fan. An average weight post of paper will be dry in 24 hours. Our latest model features dual fans as well as a powerful spring in the screw press to help maintain pressure on the drying papers. Specifications: Outside dimensions: 35" x 43" x 56" (height); inside dimensions: 30" x 40" x 23"; welded and painted steel frame around a wood box finished with three coats of marine spar varnish; screw press restraining system; thermally protected, 2 continuous duty fans; casters.